The IPCC claims that stratospheric cooling disproves solar-driven warming, but they acknowledge that this cooling was caused by ozone depletion. Other than that, solar variability is essentially dismissed in the IPCC worldview. Carbon dioxide (CO2) is the primary driver of climate change, and that’s that. But mankind has recognized the sun’s primal importance for eons. So how did the IPCC arrive at such certainty in discarding the impact of solar activity? After all, the sun’s variability appears to track rather closely with climate on millennial, centennial, and decadal timescales. For example, the Roman, Medieval, and Modern Warm periods all correspond with heightened solar activity. And the Little Ice Age suffered the cooling effects of not one, but three, solar minimums. The IPCC’s aversion to solar irradiance apparently stems from two concerns. 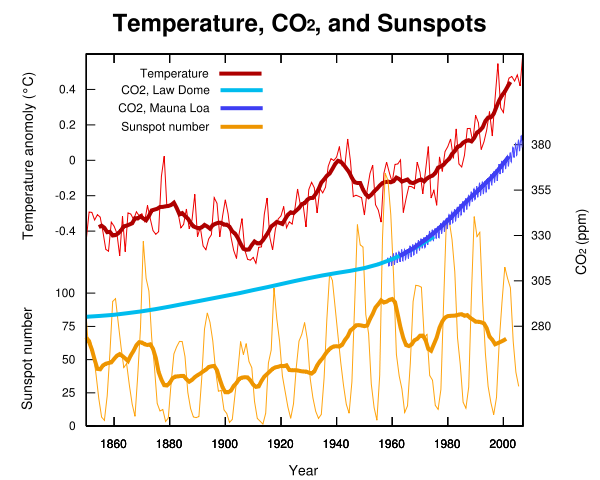 First, there’s the divergence in trajectories over the past 30 years of measurements for temperature and solar activity. The argument goes: Since solar activity stopped climbing around 1985 (and essentially peaked at that point), while surface temperatures kept climbing, this divergence proves that the sun isn’t driving temperatures. But this is a mischaracterization. The Modern Solar Maximum peaked twice, first in the late 1950s and again in the mid 1980s. Starting around 1985, solar activity plateaued—but at levels higher than anything seen in the last 1,000 to 2,000 years. In essence, the sun remained at roughly full throttle until the mid-1990s—close to the starting point for the now infamous “pause” in surface temperatures. Second, there’s the observation that, during the period ranging from about 1960 to 1995, stratospheric temperatures showed a net cooling. This decline occurred at the same time that surface temperatures were rising (driven, presumably, by increasing concentrations of CO2.) The absence of a parallel rise in stratospheric temperatures is thereby seen as negating the possibility of a solar connection. Significantly, ozone is the primary “greenhouse gas” of the stratosphere. As NASA explains it, “Ozone is both a major absorber of incoming ultraviolet in the stratosphere (leading to stratospheric heating) and a strong emitter in the thermal infrared spectrum.” Simply put, stratospheric temperature is maintained by concentrations of ozone. If ozone levels decline, for instance, temperatures in the stratosphere will fall. This direct relationship between ozone and temperature became apparent during the mid-twentieth century. Ozone suffered an existential threat as the continued release of chlorofluorocarbons (CFCs) ate away at its concentrations. Stratospheric ozone levels tumbled steadily from the late 1950s onward, creating a serious, and recognized, international problem. It wasn’t until the implementation of the Montréal Protocol in 1989 that real action to reduce CFCs took effect. Revisions to the Protocol subsequently led to a more complete ban on CFC production in 1996. As NOAA’s Ozone Depleting Gas Index demonstrates, the Montreal Protocol has succeeded in gradually restoring ozone concentrations in the stratosphere. Specifically, CFC levels in the stratosphere continually rose until roughly 1996, the point at which the effects of the Montreal Protocol began to fully register. Starting in 1996, stratospheric CFC levels actually began to decline. This action to restore ozone shows a remarkable correlation with recent stratospheric temperatures. 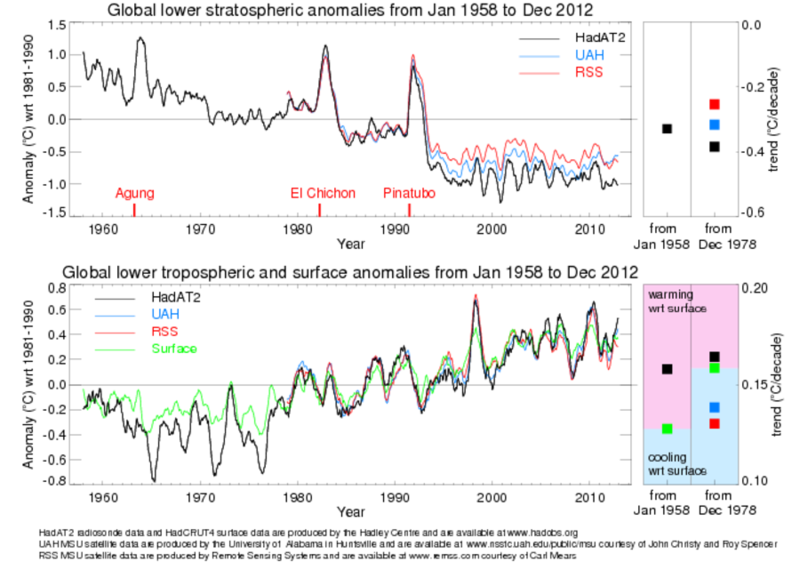 Whereas cooling in the stratosphere was continually evident from 1960-1996, and tracked closely with falling ozone levels, temperatures have subsequently leveled off. Specifically, net temperatures in the stratosphere have remained essentially unchanged since the late 1990s. It appears that the progressive cooling in the stratosphere during the twentieth century was forced by declining ozone, even as increased solar activity was driving a rise in surface temperatures. The question, then, is whether the IPCC has considered this variable when citing stratospheric cooling as an invalidator of the solar activity thesis. One has to wonder why the IPCC has chosen to deny solar variability on the basis of cooling stratospheric temperatures. The evidence seems fairly clear that a decline in stratospheric temperatures was driven by declining ozone, a factor wholly unrelated to solar variability. If so, would the IPCC wish to promote this fact? Such a correlation would finally solve a vexing, recent climate mystery. But it would also establish a more concrete solar connection to temperature variability. The evidence is compelling, and the subject deserves further scrutiny. The msnufacture and subsequent release of heavy CFCs in laboratory chambers filled with O3 is not the Stratosphere. CfC’s in amounts humans ever produced would have had an impact upon the water supply by a ration of perhaps 10 million:1 in terms of reaching the O3 layer 10-25 miles >the surface of the earth. The reason holes in the O3 layer occurs, particularly and not coincidentally at the poles, has to do with alpha and beta radiation hitting the O3 in the upper atmosphere over the poles. This occurs at peak solar cycles ever 11 years. However those cycles move in longer cycles of maximum and minimum energy ejecta (solar storms) during peak sunspot cycles. Coincidentally, the temperatures rise in peak periods and fall in low periods of sunspot activity, and O3 minimums and maximums follows that cycle with great regularity. So do CO2 cycles, except the oceanic evaporation of CO2 occures about 600 years AFTER solar heating. The IPCC is simply getting more obviously political and corrupt daily. For the record, I believe in climate change. I do not believe a trace element in the atmosphere (CO2) is any more important than 1/50th tat of H2O and I’ve done the energy modeling to prove it. Furthermore, GHG absorption accounts for only about 1/18th of the total cause of a warm atmosphere. Most of earth’s atmosphere is temperate because other black body objects absorb the enery at ground and sea surfaces, then act as thermal masses kenetically transferring the heat to the air by standard dissapation in thermodynamic transition. A refrigerator is cold because the heat is exchanged out of the objects placed inside…and the atmosphere is mainly heated and colled the same way. Get something published and peer reviewed on your astounding hypothesis which blows 150 years of climate science out of the water, LouisD, and there just may be a Nobel Prize in the offing. I suspect jimmy was being facetious. I also seriously suspect he doesn’t understand one word of what you said. All gases and dust in the atmosphere cool our planet; they don’t warm it. CFC destruction of ozone caused the stratosphere to cool 1.4 C and the earth to warm some 0.5 C. Should be back to normal by 2100. One CFC molecule destroys some 100,000 ozone molecules during its life up there. No scientists anymore, just jabberers! During the past 25 years I’ve discussed this with at least 20 scientists, and not one of them has been able to tell the mechanism by which heavier than air CFC’s make it up to the stratosphere. Gaseous diffusion takes place. That is why the oxygen and nitrogen in the atmosphere is pretty much a constant 21% O2 and 79% nitrogen. The fact that the IPCC had been so adamantly opposed to any evidence of change in climate other than the anthropogenic contribution of CO2 into the atmosphere being the driving force, should be enough for even a lay person such as myself to raise real concern. It’s impossible to be taken seriously as a scientist if you are unwilling to consider all variables. Especially when data must be altered in order to fit the hypothesis. Anyone expecting the IPCC to tell the truth about anything that will adversely impact their agenda probably believes Santa Claus will actually come down their chimney at Christmas time and eat their cookies.